The ongoing Christchurch Conversations programme provides a forum to hear from thought leaders, share good ideas, and be part of the conversation about the city’s future. The current series is being led by Christchurch City Council. Find out more about past Christchurch Conversations on Te Pūtahi’s website. Find out more below about the Winter 2017 speaker series which focused on the red zone. It was a collaboration between Regenerate Christchurch, Christchurch City Council and Te Pūtahi - Christchurch centre for architecture and city-making. 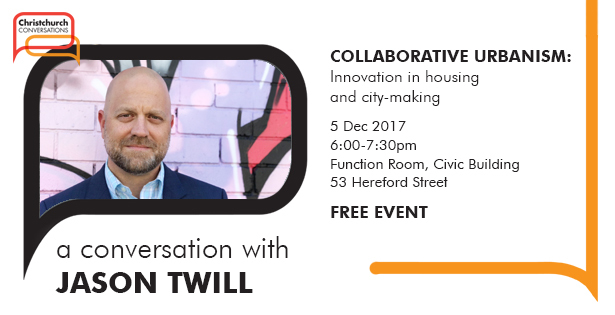 Jason Twill’s Christchurch Conversation outlined ways that sharing economy and collaborative consumption are enabling more affordable living standards in tier one cities across the world. Around the world community collectives are coming together to co-create multi-layered neighbourhoods that are affordable, intergenerational, economically diverse and socially connected. These citizen-driven and community-involved urban developments are disrupting the traditional approaches to urban housing and providing a means for more liveable, equitable and diverse cities across the globe. The evening discussions focused on dynamic new housing and place-making models for cities premised on multi-functional, live-work- play space designed for social connection and economic practicality. Engaging local, national and international speakers shared their views and ideas about land use possibilities and urban regeneration projects for the future of the red zone, now called the Ōtākaro Avon River Corridor Regeneration Area. Kristina Hill is Associate Professor of Landscape Architecture, Environmental Planning and Urban Design at Berkeley. Her current research focus is urban resilience in the changing global environment, particularly around climate change, sea level rise, and development to enhance a city's ability to recover from disaster events. Hill discussed her recent work in the San Francisco Bay Area – a region that, like Christchurch, is challenged by a rising water table in a seismic zone. She shared strategies for addressing these issues and describe recent engineering experiments used in geologic hazard areas in California. How could Christchurch adapt to the challenges and opportunities presented by climate change? What new designs and responses might work for the red zone? This event was filmed live and can be watched on YouTube (video is almost 2 hours long and includes Q&A). Share these events on social media and email friends, family, neighbours and colleagues so they can join these important conversations about the city’s future. Ryan talked about several transformative urban regeneration projects including the Atlanta BeltLine, the Rail Park in Singapore and the Los Angeles River. He described how these projects represent a new kind of cultural momentum that will reshape the way we build cities. Ryan Gravel is a United States urban planner, designer and author. He shared his experiences of how cities can be transformed by catalyst projects. Ryan's student research provided the original vision for the Atlanta BeltLine, one of the most successful and inspiring urban redevelopment programmes underway in the United States. This 22-mile transit greenway is changing the physical form of Atlanta and the decisions people make about living there. Now a US$4 billion public-private investment, the project’s health and economic benefits are already evident through the record-breaking use of its first section and US$3.1 billion of private sector redevelopment since 2005. Ryan described how this catalyst project came to life, what it means, and why it matters. Watch a short video of Ryan Gravel visiting Christchurch's red zone (video is less than 4 minutes). The Greatest Contribution: What is the greatest contribution this land could make to Christchurch and to New Zealand? Four thought leaders explored the greatest contribution the former red zone – the 600 hectares of land connecting the city to the sea along the Ōtākaro Avon River – could make to Christchurch and to New Zealand. This event was videoed. Watch it on YouTube (video is almost 2 hours long and includes Q&A). Watch a short video of Rod Oram visiting Christchurch's red zone (video is 3mins, 17 secs on Vimeo). Marjan van den Belt is an Ecological Economist and Assistant Vice Chancellor (Sustainability) at Victoria University of Wellington. Her interests are trans-disciplinary, spanning urban, agricultural and conservation land, and rivers, coastal and marine waters as they relate to human wellbeing. Marjan’s expertise is in natural capital and ecosystem services and she has worked with iwi on social ecological entrepreneurship. She holds a PhD in Marine Estuarine Environmental Science from the University of Maryland, in the United States and a Master of Business Economics from Erasmus University Rotterdam, Netherlands. Marjan co-founded a co-housing/eco-village in the US and was a Strategy Advisor to a sustainability oriented hedge fund in the Netherlands. Philippa Howden-Chapman is a professor of public health at the University of Otago, Wellington, where she teaches public policy. She is the director of He Kainga Oranga/ Housing and Health Research Programme and the New Zealand Centre for Sustainable Cities; chair of the World Health Organization Housing and Health Guideline Development Group and the International Science Council Urban Health and Well-Being Committee; and a Fellow of the Royal Society of New Zealand. In partnership with local communities, Philippa has conducted randomised community housing trials which have influenced housing, health and energy policies. She is strongly interested in reducing health-related inequalities and has published widely in this area, winning awards for this work. In 2014, her research team was awarded the Prime Minister’s Science Prize. She was the first woman and the first social scientist to win the prize. Joseph Hullen (Ngāi Tūāhuriri, Ngāi Tahu) is Senior Whakapapa Registration Advisor at Te Rūnanga o Ngāi Tahu. He has a special interest in Mātauranga Māori and Tikanga Māori and how this knowledge helps us to better understand early land use in New Zealand and make better decisions about future land development. Joseph serves on a number of Boards and Trusts including Canterbury Aoraki Conservation Board, Te Kōhaka o Tuhaitara Trust which administers the Tuhaitara Coastal Park, and Matapopore Charitable Trust which represents the interests of Ngāi Tūāhuriri as they relate to the Christchurch Central Recovery Plan (CCRP). He has spent a lifetime gathering traditional kai and listening to stories about his hapū Ngāi Tūāhuriri. He is a hunter gatherer, a fisherman, an explorer, a kaitiaki and a storyteller. Rod Oram has 40 years’ experience as an international business journalist. He is adjunct professor at Auckland University of Technology and a frequent public speaker on business, economics, innovation, creativity and entrepreneurship. Rod contributes to Nine to Noon on Radio New Zealand, newsroom.co.nz and the Larry Williams programme on Newstalk ZB. Recent publications include Reinventing Paradise (2007) and Three Cities: Seeking Hope in the Anthropocene (2016). He helps fast-growing New Zealand companies through The ICEHOUSE, the entrepreneurship centre at AUT’s Business School. Rod was a founding trustee and the second chairman of Akina Foundation, which helps social enterprises develop their business models in areas of sustainability. He has received a number of awards and in 2010 was Columnist of the Year for his editorial in Good, a consumer sustainability magazine. Jacky Bowring is a professor of Landscape Architecture at Lincoln University, Christchurch. Originally a geographer, she is fascinated by sense of place, especially in relation to memory and landscape. She has written two books on melancholy (A Field Guide to Melancholy (2009) and Melancholy and the Landscape: Locating Sadness, Memory and Reflection in the Landscape (2017) and has published widely.